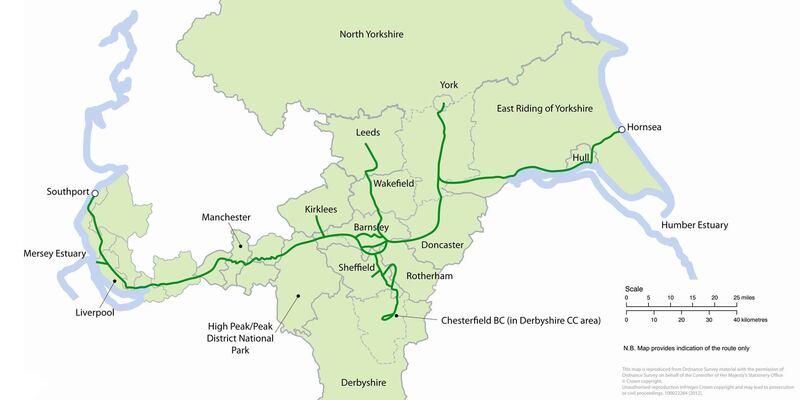 A north-south route connecting Leeds and Chesterfield, a spur to York and a spur to Kirkburton means there are approximately 370 miles (595km) of Trans Pennine Trail available to explore. A great way to explore the Trail is through one of our excellent value printed maps available through our shop . The Trans Pennine Trail is mapped and signed all the way, mainly traffic free and is surprisingly level considering the dramatic scenery along the way. Easy gradients and surfaced paths make many sections suitable for families, gentle exercise and people using wheelchairs and pushchairs. 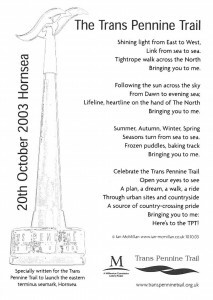 So whether on foot, horse or cycle; for a day or longer; alone with friends and family – the Trans Pennine Trail (TPT) can offer something for everyone. If you see a problem out on the Trail please report direct to our National Office via email, phone or social media. @TPT_Stockport @SustransNW @StockportMBC This is super! I am sure this section will be very well used! A big reminder that Ultra Great Britain has their Manchester to Liverpool 50 mile Ultra on Friday 19th April, using a lot of the TPT! Penistone Town Mayor Gillian Milner has presented our brilliant long-time volunteer Martin Curson (right) with the Honorary Freedom of the Town award. For more info and to book your place, visit the link below! Tasks: A mixture of tasks - cutting back regrowth and maintaining the margin at the side of the Trail, pruning Broom, removing saplings on the south bank, and creating a couple of basking areas on the north side. Parking/Travel: Please arrive on foot or bike if possible; if you need to come in your car there's plenty of parking in Penistone, there's even a dedicated TPT car park just beyond Tesco on the right. Do bring... Lunch; we'll provide tea, coffee, fruit juice and biscuits in the morning and afternoon. We do have tools and equipment, but you're welcome to bring your own (in good condition) if you prefer. Don't forget...sun screen and waterproofs! For more information and to book your place, visit the link below!